Each month I share my goals as a way to motivate myself to get things done and stay accountable. 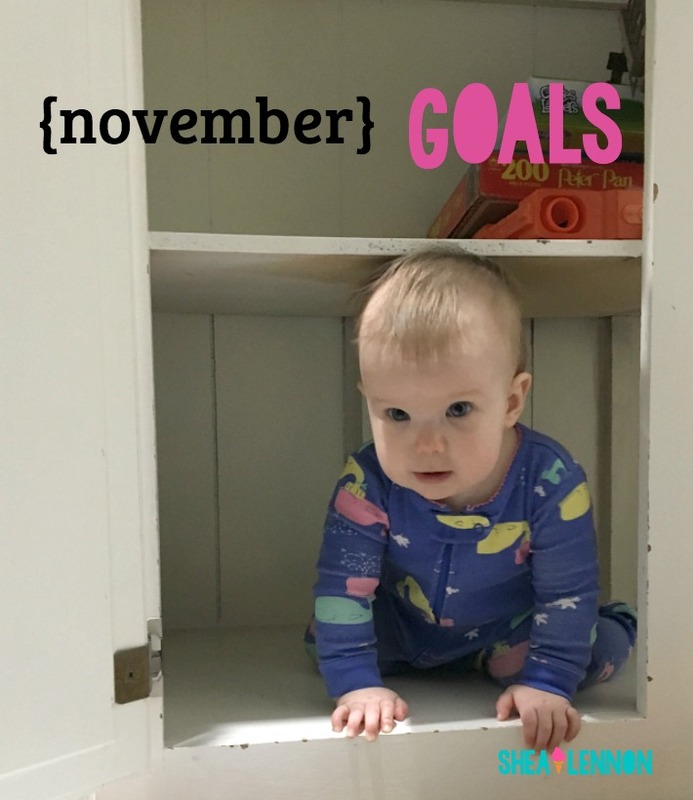 Inspired by Rising Shining, the blog written by Kelsey of The Girl Next Door podcast (a favorite of mine), instead of sharing how well I did on the previous month's goals, I'm sharing only the accomplishments to focus on the positive. - Collaborated with Alexandra on #LYBHolidayL challenge. As someone who loves challenges with daily prompts, I had so much fun creating this November challenge with Alexandra. For the full post, go here. We'd love to have you join us! - Had Violet's first birthday party. It was a stressful week (we had plumbers and a sewer repair crew at our house all day on Violet's birthday) but we managed to throw Violet a stress-free party. We kept it very simple and low-key with a sundae bar and minimal decorations. We held it at a nearby park, and thankfully the weather cooperated. - Halloween. I'm counting the holiday itself as a win. Jona loved his Minion costume and Violet tolerated hers. I was happy with how easy they were. I even put up a few decorations to get into the spirit. - Successfully fed Violet for 1 year! I feel extremely grateful that even though breastfeeding didn't work out with Violet, I was able to pump exclusively for her first year (my story here) and I didn't have to supplement with any formula. (I fed Jona formula after 3 months and there is NO SHAME at all in that--team #feedyourbaby all the way.) It was a lot of work and quite a time commitment, but I'm so thankful that I was able to do it. That may just be my biggest win of 2017! - Buy placemats and choose a paint color for the dining room. My fun home decor goals keep getting derailed by totally un-fun home repair projects. (I'm looking at you, new HVAC and sewer pipe repair!) I'm crossing my fingers that this month I can at least accomplish this small goal. House, try not to fall apart. - Start an Advent calendar. I love Advent calendars but always wait too long to put one together. This year I'm going to try to get the ball rolling early so come December 1st it will be ready to go. Usually December 1st happens and I think "I wish I would have made an Advent calendar." Not this year. - Order Christmas cards and photo gifts. This is another one I'd like to get ahead on so I'm not worried about shipping time. - Use Pinterest more thoughtfully and strategically. I'm carrying this goal over from last month. I didn't get a chance to work on this one. Linking with Writes Like a Girl and The Beth Next Door.